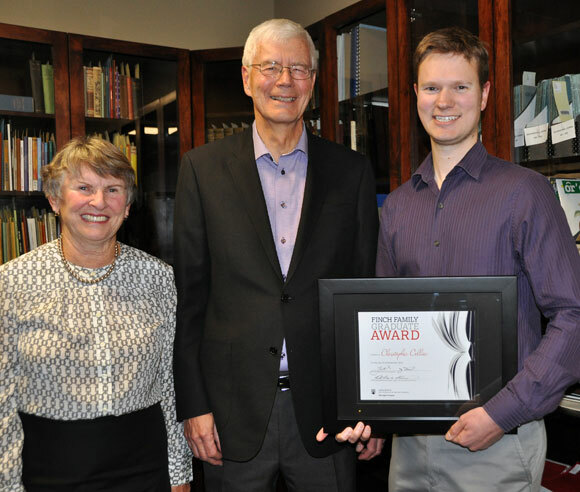 Jean and Ken Finch present Christopher Collier with the first-ever Finch Family Graduate Award at UBC. A local family is giving back to the community by making a substantial donation to UBC Okanagan. As part of Ken and Jean Finch’s commitment to enhancing opportunities for young people, their $600,000 contribution to UBC has established the Finch Family Undergraduate Award and the Finch Family Graduate Award. These substantial awards will recognize students who have demonstrated great academic focus and success, but also the qualities of well-rounded citizens, actively contributing to the quality of life in our region through community involvement, contributions to innovation and economic development. The first Finch Family Graduate Award was presented to Christopher Collier, a PhD candidate studying electrical engineering in the School of Engineering, carrying a prize of $14,000. The Finch Family Undergraduate Award was presented to Zachary Holland, a computer sciences student in the Irving K. Barber School of Arts and Sciences. This award carries a prize of $7,000, over the third and fourth years of study. The students met with the Finch family recently to take part in the inaugural presentation of the scholarships. For Holland, having some of the financial pressure taken off his final two years of undergraduate studies has motivated him to push himself even harder. The Finch family has deep roots in the Okanagan; their grandchildren are the fifth generation living in the valley. 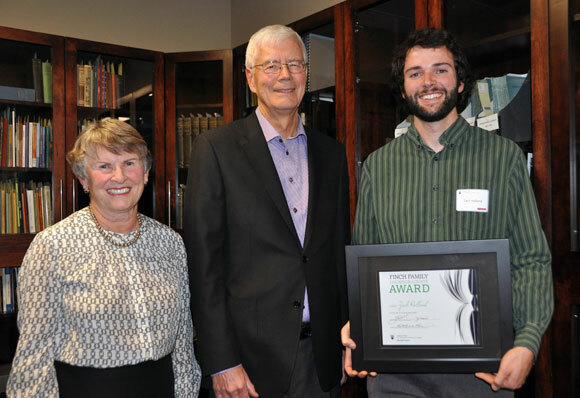 Zach Holland, right, receives the inaugural Finch Family Undergraduate Scholarship Award from Jean and Ken Finch.